Store and cut up to 18" of ribbon bolts with the Bulman M761R deluxe ribbon dispenser. The hinged top is great for loading and removing ribbon bolts, and the adjustable bolt holder provides both stability and convenience when the ribbon holding tray is not fully occupied. Rubber, non-stick feet effectively protect your countertop and keep the dispenser from slipping. It features a safe and efficient cutting system which includes a carbide steel rotary blade with a hand grip mounted on a slide rod guide. Also included is a stainless steel cutting surface and a hold-down spring for controlled ribbon-feeding. This product is sure to fit any and all of your gift wrapping, packaging, and school art project needs! 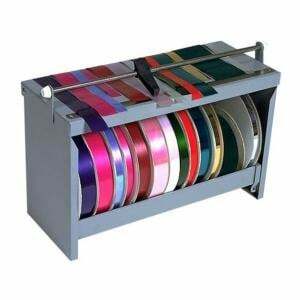 This metal ribbon dispenser is very well made. It has rubber feet so that the dispenser does not move when the ribbons are pulled. The cutter blade is very sharp and cuts our satin-edged organza ribbon in one stroke. Now my ribbons are all organized. Love it! This is great to have at the bakery. Customers always want different colors around their baskets and it keeps the ribbon together and no scissors are needed because of the cutter. Awesome buy.